The Pride SG began in the summer of 2015, with a small group of friends who were excited about the rumors of a new professional soccer team coming to play in Cincinnati. The name “The Pride” was chosen based on the leaked logos for the soon-to-be-announced FC Cincinnati, combining the idea of being proud to have a soccer team to support in town and the official name for a group of lions. FC Cincinnati was introduced to the public shortly after, and The Pride was there as the first official Supporters Group for the fledgling team (though, it should be noted: The Pride was not actually part of the announcement press conference, as the team elected to use a paid “street team” to try and show enthusiasm during the announcement). The early days of FC Cincinnati were fraught with missteps, many of which have been documented in other places. For a fledgling supporters group, the task of organizing support in a city that had never before supported soccer was, to put it mildly, an undertaking. The club, and anyone who dared label themselves a “supporter,” were under a barrage of attacks from people around the country, many of whom were angered by the perceived injustice of a deep-pocketed investor starting a soccer team in a city where an existing semi-professional team was already running. It was made abundantly clear: no one in the soccer world liked FC Cincinnati or the people trying to support it. 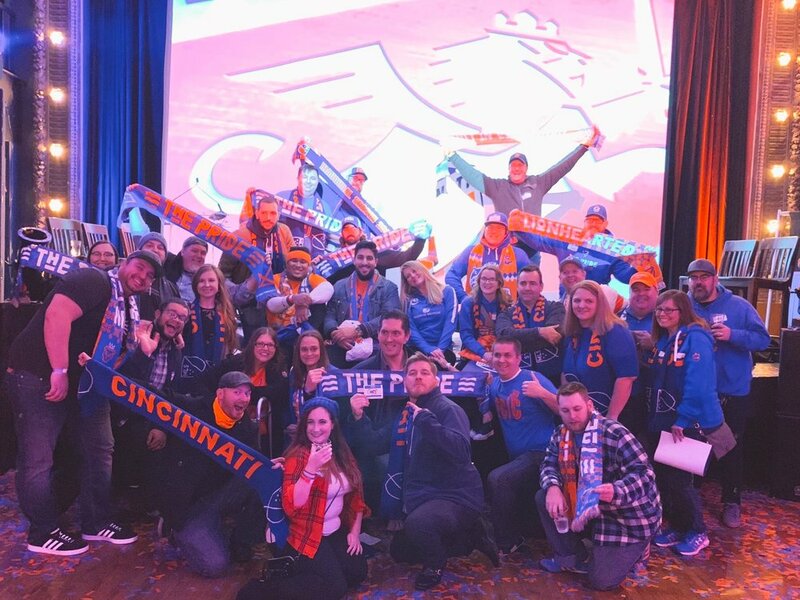 As the first officially declared supporters group for FC Cincinnati, the original organizers of the Pride participated in numerous events and meetings with the FC Cincinnati front office in an effort to prepare for what was coming in 2016. 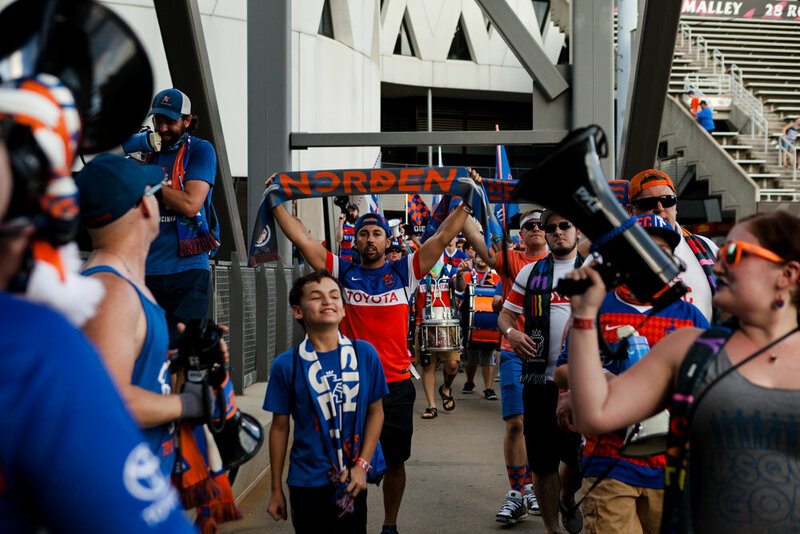 It was during those meetings that it became apparent to early-members of the Pride that an organized supporters group, not merely a group of friends working together, was going to be needed for FC Cincinnati be successful. As 2015 turned to 2016, The Pride began the work of getting ready for the start of FC Cincinnati’s inaugural season. On March 2nd, 2016, the Pride held it’s first official open meeting at Molly Malone’s in Covington, KY. At that meeting, attended by the first twelve members of the Pride, the decision was made that the Pride needed to be an open, transparent, and independent supporters group to ensure that it could continue long into the future should FC Cincinnati achieve its then-audacious dream of becoming the first successful pro-soccer team in Cincinnati history. The Honor Code of the Pride, as well as the organizational bylaws, were drafted and approved, and the first officers were elected by acclimation: Payne Rankin (President), Chris White (Vice President), Matt Broo (Secretary), Mark Szwejkowski (Treasurer), Zach McClurg (Matchday), Brandon Trame (Membership) and Hannah Motz (Creative). As the FC Cincinnati season began, the “firsts” continued for the Pride. The Pride was there on March 26, 2016 for the first game in FC Cincinnati history, a road match against the Battery in Charleston, South Carolina. The Pride partnered with fellow supporters’ group Die Innenstadt to work on the first tifo in FC Cincinnati supporters history. The three part tifo (now comically small, by comparison to later work) featured both SGs logos as well as an art display with the caption “Defend the Queen City!” It was displayed prior to the first ever FC Cincinnati home match at historic Nippert Stadium. It was at that first match that a number of traditions were established, including the “March to Nippert,” as supporters from various groups converged to enter Nippert Stadium and The Bailey as one. The first match also served as the debut for several of the now-familiar songs heard ringing throughout the Bailey, including “Cincinnati, Here We Go” and the “Reading Rainbow Song,” all the product of collaboration with fellow SGs. It was also in 2016 that FC Cincinnati’s rivalry with Louisville City FC was born, along with a new tradition for The Pride. After some initial discussions before the season, the inaugural “Plastic Cup” was held between The Pride and The Coopers, the largest supporters group for Louisville City. The Cup was played over two legs, one held in Cincinnati and the other in Louisville, prior to two of the Louisville City / FC Cincinnati matches. The Pride emerged victorious, penning their name to the Plastic Cup and forever holding bragging rights for claiming first blood in the contest. As the Calendar turned to 2017, changes came to The Pride in order to accommodate the exploding popularity of soccer in Cincinnati. The Pride’s official pre-match bar was moved to Ladder 19, and the now-traditional March to Nippert route down Short Vine became official. As part of the release for the second scarf in Pride history, the tagline “Lionhearted” was adopted and continues to adorn Pride gear to this day. 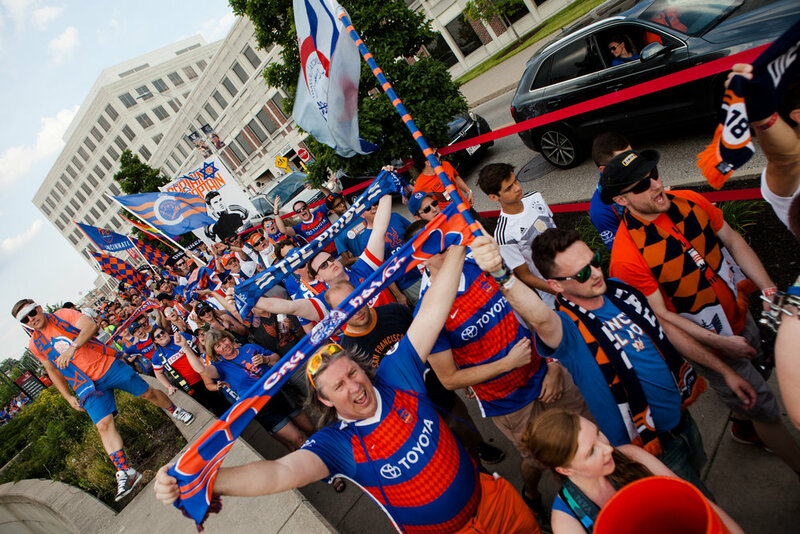 The year also marked the beginning of FC Cincinnati’s Major League Soccer bidding process, and members of The Pride were on the front line of the push. In January of 2017, FC Cincinnati officially submitted its bid to become one of the four expansion sides for MLS. It became understood, quickly, that a successful bid for FC Cincinnati would require the Cincinnati community to get behind and support a new soccer-specific stadium in the urban core of the city. In response to this need, then Pride Vice President Chris White penned an opinion editorial to the Cincinnati Enquirer announcing the creation of “Build It Here,” a group formed to organize efforts to get a soccer stadium built in Cincinnati for FC Cincinnati. 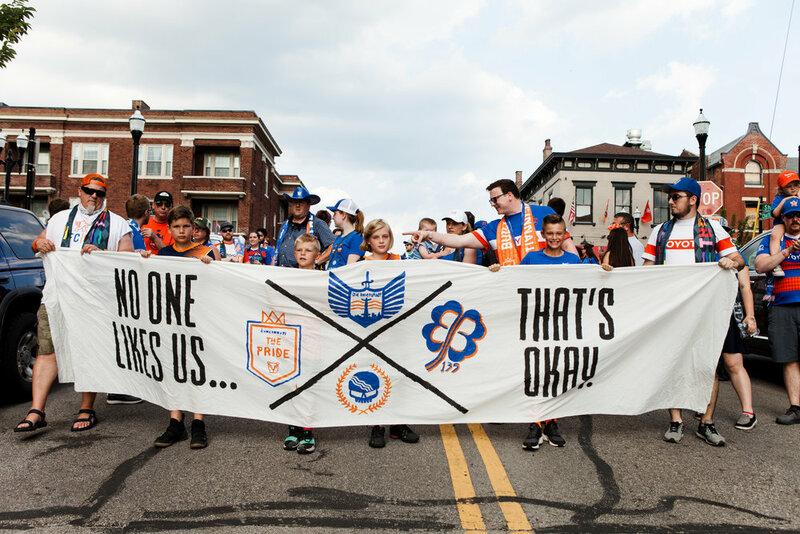 This editorial was co-signed by the other members of the Pride Executive Board along with prominent members of other FC Cincinnati Supporters Groups, including leadership from Die Innenstadt, the Legion and the Bailey Bastards. 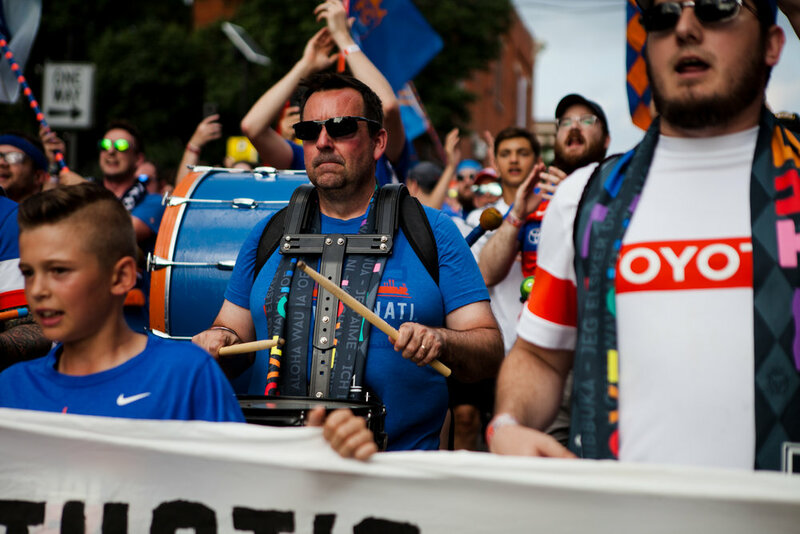 For the remainder of the year, Pride members (led by Membership Director Max Ellerbe), participated in numerous civic events, meetings, and letter writing campaigns to grow support for the FC Cincinnati stadium effort. These efforts were rewarded in November of 2017, as both Cincinnati City Council and the Hamilton County Board of Commissioners, voted to support an FCC stadium, paving the way for FC Cincinnati’s final push to MLS. Today, the Pride continues the work that started in 2015 long before anyone knew or had any idea what FC Cincinnati would become. As Don Garber announced that FCC had won an MLS expansion spot, to being play in 2019, members of the Pride were on stage cheering and singing along. Like MLS, the Pride continues to expand, as we welcomed our first satellite chapter (The Pride Norden) for the Northern suburbs / exurbs of Cincinnati. Whatever the future holds for FC Cincinnati in MLS, you can be assured that the Pride will be there.